The health of our natural ecosystems is essential to maintain the current quality of life that all Victorians enjoy. We are lucky to have areas of remnant vegetation within the Melbourne metropolitan area that are important refuges for native animals. The Burke Road Billabong Reserve (the reserve) represents one such area of native vegetation. Although the billabong itself has been dry for many years, there are still significant environmental values present that this management plan aims to protect. The Reserve is home to many species of native flora and fauna, including remnant river red gums. The land was reserved for the conservation of an area of natural interest and public recreation in September 2008, making it one of Victoria's youngest reserves. The Burke Road Billabong Reserve Committee of Management (the Committee) has been managing the land since its reservation. Since then, the transformation of the land is evident by the reduction in weeds, safer walking and cycling tracks and increased native vegetation. The reserve is highly valued by local residents and commuters utilising the walking tracks including the Main Yarra Trail which links Southbank to Westerfolds Park in Templestowe. This management plan recognises the multi-uses of the reserve and aims to ensure the valuable social and environmental values of the reserve are protected and enhanced for future generations. I congratulate the Burke Road Billabong Reserve Committee of Management for preparing such a comprehensive plan for the Reserve and for its ongoing dedication to improving the environmental and recreational qualities of the reserve. These objectives will be accomplished by the reduction of weed species and the increase of native vegetation. Opportunities for active and passive recreation will be increased by maintaining the internal path network and introducing a picnic area. It is also envisaged that the plan will create greater appreciation by users of the Reserve through the introduction of interpretive signage. The Management Plan was developed in consultation with the Department of Sustainability and Environment and local residents. The plan will apply to the land for a period of 5 years, after which it will be fully reviewed and renewed. As part of implementation, the Committee will submit to the Department of Sustainability and Environment successive 12 month work plans detailing the works to be undertaken. ~ The establishment of a restored "beach head" area from which to steadily progress into the remainder of the Reserve. The Burke Road Billabong Reserve (the Reserve) is approximately 3 hectares of Crown land within the Municipality of Boroondara. The Reserve is Crown land under the management responsibility of the Burke Road Billabong Reserve Committee of Management Inc. (the Committee). 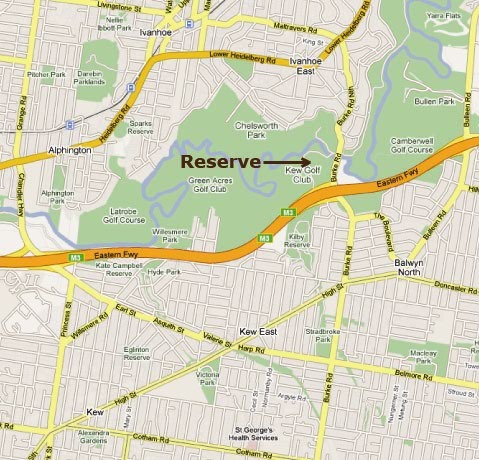 The Reserve is located between Burke Road, the Eastern Freeway, Kew Golf Course and the Yarra River (see Figure 1). The Reserve adjoins a larger area of land that is currently under management of VicRoads. This land is indistinguishable at ground level from the Reserve, and processes are in place to have this land transferred to the Crown, reserved, and the Committee appointed as the land managers. 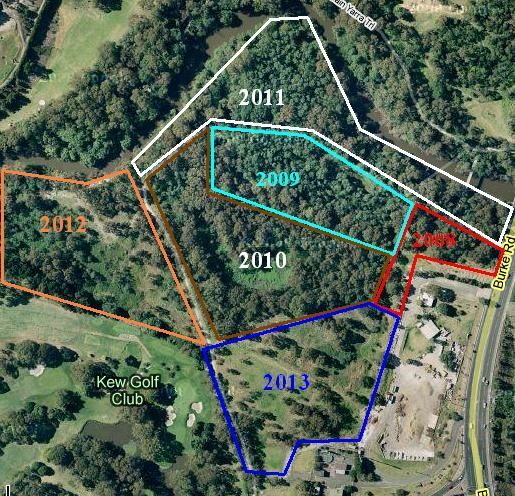 The Reserve is Crown land known as Crown allotment 2038, Parish of Boroondara (see figure 2). The land was reserved on the 23 September 2008 for the conservation of an area of natural interest and public recreation. The Reserve is approximately 3 hectares in size. 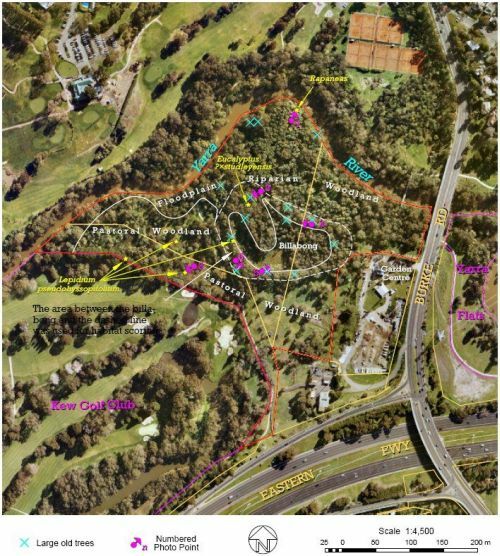 The Reserve is managed by the Committee who were appointed by the Minister for Environment and Climate Change to manage the reserved land, excluding the Main Yarra Trail and Koonung Trail bike paths. A parcel of land (lot 1 TP834511 in Figure 2) adjoining the Burke Road Billabong Reserve is currently owned by VicRoads, and has the potential to be incorporated into the Reserve in the future. At the time this report was written, transfer of the land from VicRoads to DSE was being processed. DSE acts as the land owner for the Reserve on behalf of the Crown. The DSE also has a role in supporting the Committee of Management. The Minister for Environment and Climate Change appointed the Committee as the delegated managers of the Reserve on 23 September 2008 (published in the Victorian Government Gazette on 25 September 2008). VicRoads are currently the body responsible for the maintenance of the Main Yarra Trail which runs through the northern section of the Reserve. The maintenance undertaken by VicRoads includes mowing/slashing 1m either side of the path, and any track maintenance required. VicRoads owns approximately 6.5 hectares of land adjoining the Reserve which is indistinguishable at ground level from the Reserve. There is a VicRoads depot on land adjoining the Billabong site. VicRoads have agreed to the Committee undertaking weed removal etc. within their land. Vic Roads regularly and routinely mow the area for fire protection. The billabong is currently dry and last held water from February to April 2005. Although the billabong has historically flooded and dried, this cycle may not continue due to changes in the flow regimes of the Yarra River caused by the building of dams, water extraction and the construction of the Eastern Freeway. Should flooding of the Billabong occur in the future, it may leach farm chemicals into the Yarra River from old agricultural drums which have been found beside the billabong (Lorimer, 2006). Weeds have replaced most of the native ground flora in the Reserve. At the northern end of the Reserve is one native muttonwood tree (R. howittiana), the remaining survivor of a previous copse of 11. Other muttonwood trees occur on the opposite side of the Yarra River. During the prolonged inundation of the Billabong in 2005, much of the flora within the billabong did not survive, including an indigenous prickly currant-bush (C. quadrifida) situated on the north-west bank of the Billabong. River red gums (Eucalyptus camaldulensis) and silver wattle (Acacia dealbata) appeared unaffected (Lorimer 2006). 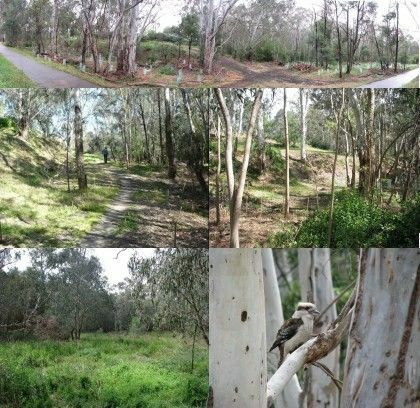 The Reserve contains viable populations of numerous flora and fauna species that have been listed as threatened or endangered in the Boroondara locality and throughout the State of Victoria (Department of Sustainability and Environment, 2005). A recent assessment of the Reserve (Lorimer 2006) describes these. This assessment further recognises two relatively intact Ecological Vegetation Classes (EVCs): Floodplain Riparian Woodland and Floodplain Wetland Aggregate. 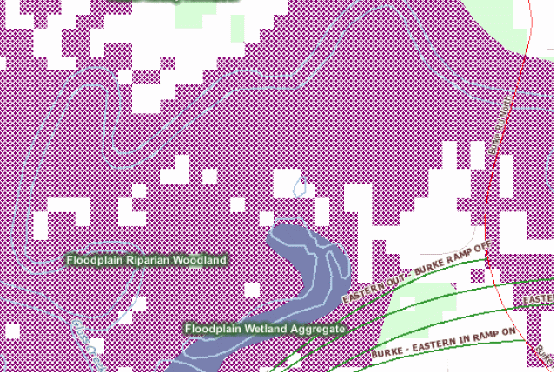 EVC mapping provided by the DSE indicates that only Floodplain Riparian Woodland occurs within the boundary of the Reserve, and the Floodplain Wetland Aggregate occurs within VicRoads land (See figure 4). The pastoral woodland was observed to be habitat for tiger snakes (Notechis scutatus) , and the common blue-tongued lizard (Tiliqua scincoids) . It is also likely to provide habitat for a number of other native fauna species (Lorimer, 2006). 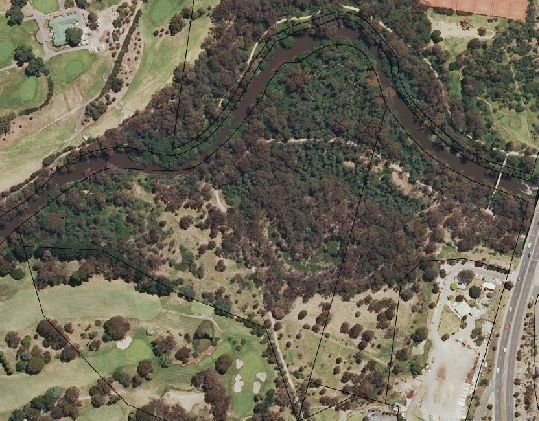 The area contains three remnant river red gums within the Reserve, and a further eleven occurring within the adjoining VicRoads land that appear to have survived the previous land clearing practices. They occur on the banks of the billabong and the banks of the Yarra River and are marked with blue crosses on figure 5. South and west of the billabong in the area referred to as 'pastoral woodland' there has been patchy regrowth of native trees (principally acacias), and the few indigenous shrubs in existence, appear well outnumbered by blackberry (Rubus fruticosus). The ground flora is predominantly invasive species. Chilean needle grass (Nassella neesiana) is an emerging concern. A number of locally significant animal species have been recorded on the Reserve. These include a number of frogs and birds that are listed as vulnerable or endangered in Boroondara (Lorimer, 2006). A full listing of species can be found in Appendix 4. Weeds of greatest concern are boneseed (Chrysanthemoides monilifera ssp monilifera), bitou bush (Chrysanthemoides monilifera), boxthorn (Lycium ferocissimum), chilean needle grass (Nasella neesiana) and gorse (Ulex europaeus) (See Table 2). There is a lack of data on fauna species present in the Reserve with the latest observations being recorded in 2005. Surveys by students and friends groups will be encouraged. Enlisting the assistance of the local community in reporting fauna sightings is regarded as important. Native birds and mammals frequently come into urban areas to feed from native trees but are unable to breed due to lack of sufficient nesting tree hollows. The Melbourne Wildlife Sanctuary at LaTrobe University has designed various nesting boxes which are species-specific and designed to exclude predator species. Bat boxes have been erected at Wilson Reserve 5km downstream from the Reserve and are monitored regularly. Ten bat tubes have already been installed in this Reserve (October 2008). Monthly checking of occupancy is scheduled. Other species that use nest boxes and were recorded in previous surveys as inhabitants of the Reserve include parrots and possums (La Trobe University 2008 and Lorimer 2006). More impact could be made at the entrance points to the Reserve with signs and information boards. There is the potential to enhance the entry from the NE (Garden Centre), with signs to explain the revegetation program. Installing picnic facilities near this entry point would improve the amenity of the location for visitors. At present the only area available for visitors to the Reserve to park vehicles is at the Garden Centre car park. The owner of the garden centre allows visitors to park here. However, should visitor numbers increase, alternate parking will have to be considered. ~ Installation of signs and an interpretive display. ~ Continue revegetation to enhance aesthetics of area. ~ Installation of additional signs (tie in with existing Main Yarra Trail signs). Existing signs are rudimentary. No information boards exist at all. They need not only to provide information on the above but also deal with links to other areas of interest and any potential hazards to visitors. Information boards should be located near future infrastructure (eg picnic table, fences, viewing points etc.). Bicycle paths through the reserve are maintained by other authorities, however, the restoration work should not encroach on the formal paths or 1 metre either side. Restoration work will seek to enhance the amenity of the paths for all users; cyclists, joggers, or pedestrians. 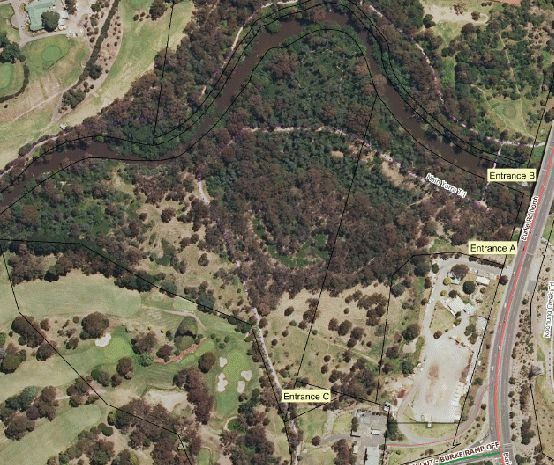 The Canoeing Guide to Victoria lists the Burke Rd bridge as an access point to the Yarra River. At present, access to the river at this point is limited. Canoe access, via the garden centre car park, will be maintained, and subsequently improved if funding becomes available. At present, access to the river for fishing is limited. An access platform for fishing, also to be used for canoe access, will be investigated. Potential grant sources include DSE, Parks Victoria, Melbourne Water, City of Boroondara and the Landcare Program, Port Phillip and Westernport Catchment Management Authority, Australian Government and the Department of Planning and Community Development. As described above, the results of any research done on the Reserve, and the evaluation of any current management actions will determine future management practices. ~ The entrance to the area from Chris Cross Garden Centre and Koonung Bike path including a large area of African Boxthorn. ~ Bat tubes will be installed in this area. ~ Picnic area to be established and seating installed. The following workplan (Figure 8) lists timelines for areas to be weeded and revegetated and for other recommendations in the Management Plan to be completed. 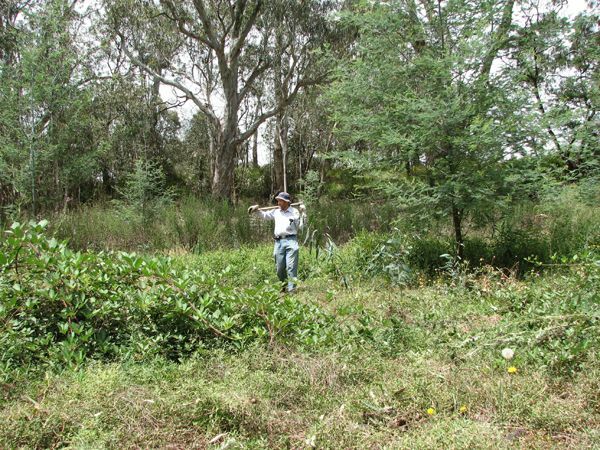 Declared weeds will be managed annually as will the area containing the Billabong. It is expected that in addition to natural recruitment of acacia species, prickly current-bush and tree violet, 1,000 extra plants will be needed for revegetation of these areas each year. The staging over six years takes into account the recommendation in the site assessment to devise and implement a staged program to control declared noxious weeds such as blackberry and hawthorn, and follow up the recent control of gorse. The Committee aims to remove these weeds over several years, synchronised with a program to plant indigenous shrubs to provide substitute habitat for small birds such as wrens (Lorimer 2006). With additional funding, this plan may be expedited, however it should not be expedited to the detriment of habitat maintenance. An annual report will be provided to DSE each March which will list work completed during the previous 12 months and any information gathered as part of regular monitoring.